SINGAPORE - With its playgrounds, colourful design and pictures of animals, the new paediatric centre at the National University Hospital (NUH) can be easily mistaken for a children's theme park. But that is exactly the intention behind the NUHkids Specialist Centre, which opens to the public on Monday (Jan 14). The new building, with 10 storeys, brings together all the hospital's outpatient paediatric services under one roof, with a design that incorporates nature and science. The centre also has a one-queue system, in which patients get a ticket with one queue number for their entire day's appointments. "We wanted to make the experience of going to the hospital pleasant and comfortable, as well as easy to navigate, for the child, family and caregivers," said Associate Professor Daniel Goh, chair of the Khoo Teck Puat-National University Children's Medical Institute. The institute currently manages close to 80,000 outpatient visits a year, with an average annual growth of 6 per cent for the past five years. With the new paediatric centre, the institute will have a potential capacity to handle about 110,000 outpatient visits annually. 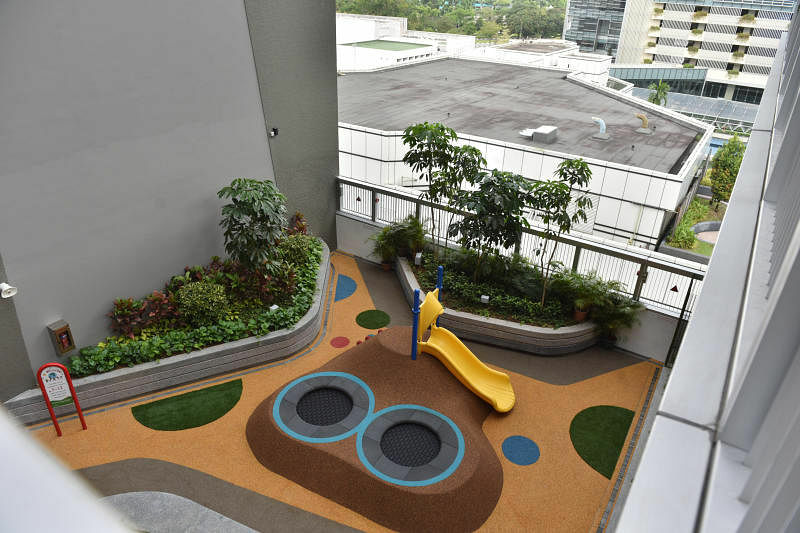 The three floors where the consultation rooms are located each have a theme - rainforest, savannah and arctic - and an outdoor playground on each floor. 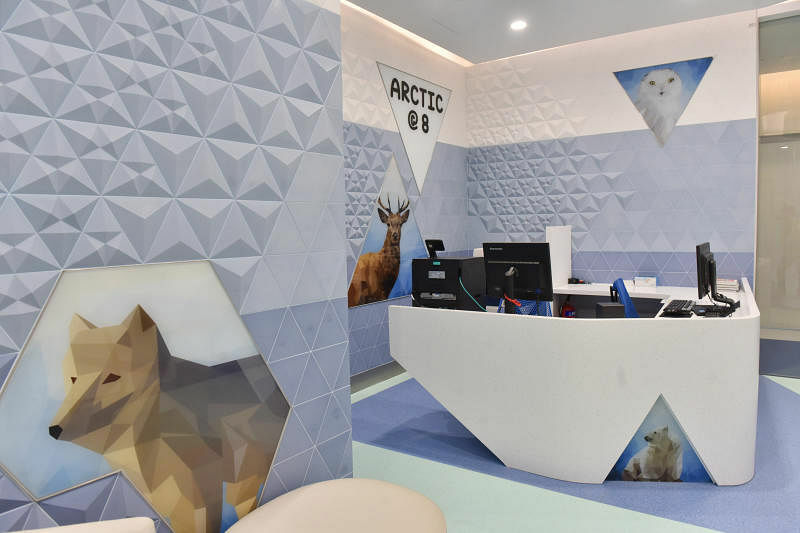 NUH also roped in partners such as Science Centre Singapore to provide interactive exhibits on the three themed floors, and Wildlife Reserves Singapore, which will showcase wildlife images and educational information. Swedish furniture giant Ikea has also furnished the breastfeeding rooms and rehabilitation centre, while Swiss flavours and fragrances company Givaudan designed subtle scents to complement the theme on each floor. The centre, which is located beside the paediatric wards, houses medical, nursing and clinical support services, including art therapy, dietetics and rehabilitation. Previously, these services were spread out over the NUH campus. Sub-speciality services that require special equipment and procedures such as those for the eye, ear, nose and throat, dental services and cancer treatment, will remain in their respective clinics in the hospital. With a capacity of 3,650 sq m, the centre also allowed for the expansion of services, such as the Paediatric Feeding and Nutrition Clinic. The clinic now comes with a kitchenette and an observatory room with a one-way mirror that allows doctors and parents to discreetly observe the child's interaction with the therapist. In addition, there are improved workflow processes, such as having two or three service associates in a group of clinics, instead of one in each clinic, said Prof Goh. There are still more services to come, with the diabetes and orthopaedic clinics opening from the second quarter of this year. Two of the floors - levels 9 and 10 - have been left vacant for future expansion. The centre was constructed taking into account feedback from parents and children. It was funded from a $50 million donation from the Estate of Khoo Teck Puat in 2010, and took two years to build, from 2016 to 2018. It took over the site of the former Radiotherapy Centre, which has since moved to the medical centre.